Synopsis: In a top-secret laboratory complex, researchers are working to make practical the age-old dream of manned spaceflight. In one experiment, a monkey is given an injection and then placed in a cold chamber. The temperature drops to over 100 degrees below zero; the monkey is quickly frozen solid but when it is thawed out it's as good as new. In a similar manner, we are told, astronauts will one day hibernate during long space journeys. Later Dr. Huburtus (Michael Fox) is working inside the chamber alone when the door slams shut behind him. The controls begin to turn on by themselves, plunging the temperature inside the chamber to -100 degrees. Huburtus freezes to death, as does his assistant (Marian Richman) when she tries to go inside the chamber to rescue him. The two mysterious deaths cause station director Dr. Van Ness (Herbert Marshall) to call in the Office of Scientific Investigation (OSI), a sort of brainy FBI. Soon Dr. David Sheppard (Richard Egan) arrives at the facility, which is located in the desert southwest. Sheppard is brought in via helicopter, as the base is inaccessible by road. As the helicopter approaches the base, the controls begin to move by themselves, and the pilot lets go of them. He explains to Sheppard that the last part of the voyage is controlled by the installation's computer, NOVAC. This, he says, is in order to keep the exact location of the base a secret. Dr. Sheppard is introduced to Joanna Merritt (Constance Dowling), who is tasked with giving Sheppard a tour of the facility. However, we soon find that Joanna and Sheppard have been lovers, a fact they keep hidden from the rest of the personnel at the base. Sheppard is shown the various experiments going on in the lab. We see a chamber where gravity can be artificially reduced, and a man and a woman do acrobatic feats in a near-weightless environment. In another part of the facility, a centrifuge whirls prospective astronauts around at dangerous speeds. Dr. Van Ness shows Sheppard a scale model of a planned orbital satellite. America, Van Ness says, must be the first to launch such a satellite. If the enemy gets into space first, it could be the end of the United States. To prove this dubious claim, he shows Sheppard a parabolic mirror that will be mounted on the satellite. The mirror is designed to focus sunlight into a mercury-filled chamber, creating steam and powering the space station. However, he warns, such a mirror could be used for more sinister purposes. He uses the same kind of focusing mirror to direct sunlight on a scale model of a "an industrial city on the shores of Lake Erie". The model city bursts into flames as soon as the focused sunlight touches it. Comments: Gog was the third and last of Ivan Tors' series of films about a near-future government body, the "Office of Scientific Investigation", that solves mysteries of a scientific nature. The first of these, The Magnetic Monster (1953) , is a clever little film in which a misguided scientist exposes a chunk of "serrenium" to some exotic radiation. The element becomes strongly magnetic and starts growing exponentially. The scientists discover that jolts of electricity stop the element's growth, but only temporarily; and each time an exponentially larger charge of electricity is needed. The OSI must find a way to destroy it before it destroys the world. The Magnetic Monster is mostly remembered today for its clever use of cyclotron footage from an expensive German film called Gold (1934). While a bit corny and melodramatic, The Magnetic Monster was still a lively and well-paced movie. The same cannot be said for the second OSI film, Riders To the Stars, the first of the series to be shot in color. In this film, rockets launched beyond Earth's atmosphere rapidly disintegrate, due to the bombardment of cosmic rays. The OSI scientists must find a way to get rockets safely into space before the Soviets do, because (as in Gog) the first nation to reach orbit will dominate the world. Knowing that meteors fly through space without disintegrating, the scientists hatch a plan to launch three men in separate rockets to try to catch a small meteor sample and return it to Earth, in hopes of finding alloys that can survive the dangerous conditions of outer space. The problems with Riders to the Stars are numerous, and expose Tors' weaknesses as a storyteller. The script is talky, Richard Carlson's direction is leaden, and plot holes abound. It doesn't make sense, for instance, that the meteors must be retrieved from space, since meteors routinely fall to earth. The men chosen for the mission are required to be single, for no adequately explained reason. And none of the recruits are called upon to use any of the science and engineering backgrounds that were deemed so important to their selection in the first place. In the end, they're chosen to fly the rockets based on physical endurance, steely nerves and raw courage, which makes you wonder why they didn't just recruit test pilots to begin with. Gog was the only one of the three to be shot in 3D (though for some reason it wasn't released in that format) and apparently the only one to be shot in widescreen. Only one partially intact 3D print has been discovered, and there don't appear to be any widescreen prints extant at all. 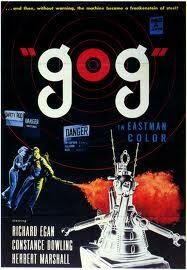 I wouldn't call Gog a good movie, but it's interesting. The production values are surprisingly robust for an indie production, somewhat reminiscent of Jack Harris' work with Valley Forge Studios in the late 50's and early 60's. And whether intended at the time or not, the whole concept of the underground lab and the work it's engaged in provides an aura of menace and paranoia. Early in the film we learn that the base is so super-secret that it was built underground, an no trace of it can be seen from above. The helicopter that brings Sheppard to the lab flies that last part of the route on autopilot, to prevent anyone from knowing its exact location -- even the people who work there. But this seems like an absurd level of security. After all, the Soviets didn't seem to have any trouble finding it. While not every plot point makes sense, some of the ideas expressed in the film are surprisingly prescient. Gog and Magog (and in fact all the electronic controls on the base) are operated through the mainframe computer NOVAC via its centralized transmitter. The Soviets* gain access to base controls by means of a secret transceiver that was placed inside the mainframe during the unit's assembly in Switzerland. So in modern parlance, the Soviets manage to hack into the computer and its wireless network, allowing them to monitor all actions taken by NOVAC and to take control of it -- like a modern remote desktop -- when it suits them. These ideas expressed in a rather clumsy fashion throughout the movie, but the fact that they're expressed at all is actually pretty impressive for a movie made in 1954. I don't think Gog has ever gotten credit for this, but perhaps it ought to. 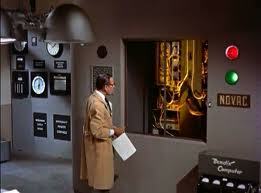 The screenwriters assume that the hack into NOVAC must be via direct line-of-sight transmission -- more like a microwave link than a conventional radio transmission. In order to establish the line of sight to NOVAC, the Soviets build a high-altitude aircraft which, because it has a fiberglass hull, is undetectable by radar; what we would describe today as a stealth aircraft. As the title suggests, it's Gog and Magog who are the real stars, and they are pretty convincing robots for this era. Rather than a mechanical man that stumps around on two legs, these robots run on tractor treads and carry a nasty collection of pincers and flamethrowers. They don't get a great deal to do, but they sure do look imposing. Left unsaid is why these robots are equipped with heavy weapons in the first place; nor do we ever find out why they are named after the biblical minions of Satan. Kind of an unfortunate choice on the part of the good guys -- unless we are supposed to walk away wondering if we really are the good guys. Given that this is 1954, though, I'm guessing that wasn't the filmmakers' intent. Gog runs a brisk 85 minutes but its pace is painfully slow, and like all of Ivan Tors' OSI movies there are a lot of long scenes of someone explaining the workings of this or that scientific apparatus. 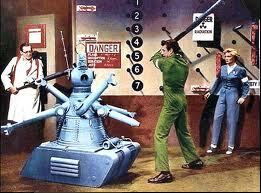 The action scenes are jealously measured out, with Sheppard's big fight with the robots saved for the climax. Even that scene is pretty tame by today's standards. But that's okay. Ivan Tors was never known for staging action sequences -- as he would prove the following year when he produced the dull-as-dishwater Science Fiction Theater. *In a peculiar -- but quite durable -- convention in Cold War films, the Soviets are never referenced directly. They are always referred to obliquely as "the Other Side", etc. 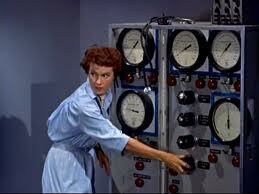 Early in the film Dr. Van Ness tells Sheppard that the base is being sabotaged by "an enemy power". "But we're not at war," Sheppard replies. "We weren't at war the night before Pearl Harbor either," Van Ness says darkly, evincing a level of paranoia that makes me wonder how we survived that era at all. I rather enjoyed this one, with Herbert Marshall returning from RIDERS TO THE STARS.